This is a condition affecting the large tendon (tibialis posterior) that runs around the inside of the ankle and into the foot. There is degenerative change within the tendon and inflammation around it. In the long term, this may lead to flattening of the foot (loss of the arch) and eventually to degenerative change in some of the joints in the foot. It is not fully understood but is related to the blood supply to this area of the tendon. It is most commonly seen in middle aged ladies although can occur at any age and is occasionally seen in young athletes. It is seen more often in patients who have diabetes, hypertension or who are somewhat overweight. Usually, there is a gradual onset of pain and swelling along the inside of the ankle and foot. The foot may gradually look flatter with a loss of the arch on the inside. You may find a progressive limitation in your level of activity. The problem may progress over many months or even years. Are there different degrees of severity? Yes. 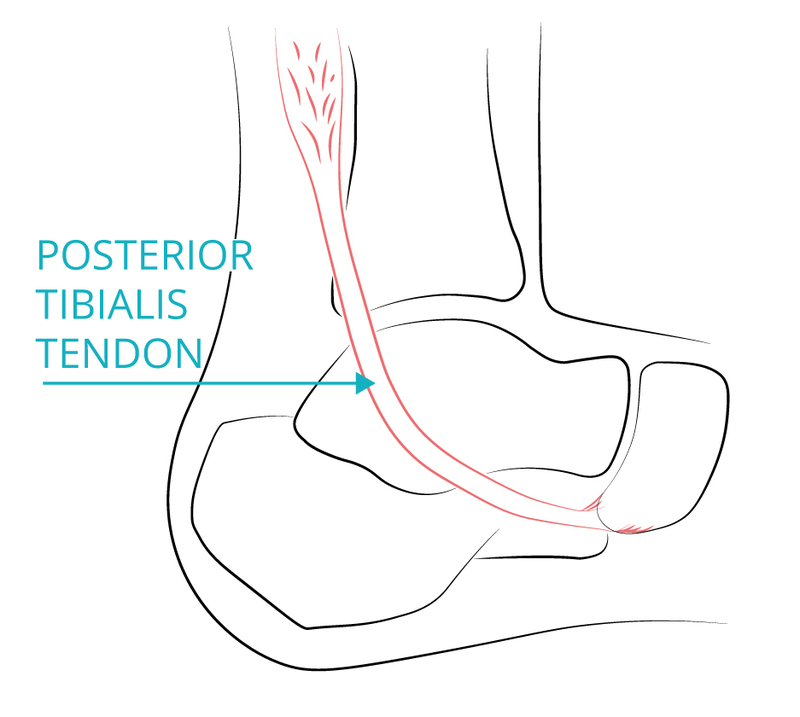 Like most medical problems, tibialis posterior dysfunction can range from very mild (the patient may have some discomfort and swelling) to severe (the patient may have a completely flat foot with loss of the arch on the inside and a very stiff foot which is painful). This depends on the severity of the problem. It may be possible to treat this without surgery using anti-inflammatory medication, orthotics (shoe inserts) or a period of time rested in plaster then physiotherapy. There are several surgical options available again depending on the severity of the problem. Debridement (surgically ‘cleaning’) of the tendon may help. Often, at the same time, another tendon from nearby is ‘borrowed’ to reinforce the damaged one and the position of the heel bone is altered to prevent the progression of the flat foot. In more severe cases, fusion of one or more of the joints in the back part of the foot may be done to correct the deformity and decrease the discomfort. Again, this will depend on the severity of the problem and type of operation. However, in general, you can expect a substantial improvement in your level of symptoms after surgery. You will be in plaster from knee to toes for 6 to 12 weeks. Usually, you are not allowed to put weight through the foot for the first 6 weeks. You will be seen in clinic at 10-14 days after surgery to check the operation site and change your plaster. You will be seen again at 6 weeks. At this stage you may require an X-ray and another plaster (depending on your particular operation). Physiotherapy is often recommended after the plaster is removed. Your foot will gradually improve but it commonly takes 6 to 12 months to fully recover. Occasionally, some patients have complications such as infection, nerve or vascular damage or loss of correction with ongoing discomfort. If your foot is comfortable, you can keep it elevated and work in a plaster and you have a sedentary job, you may return to work after 2 to 3 weeks. However, if you have a manual job or work in a dirty environment, you may need 3 months or more off work. If the operation is to you left foot and you drive an automatic car, you may drive within a few weeks of the surgery. Otherwise, you will need to wait until the plaster has been removed and your ankle is strong and flexible enough to use the pedals. This is for the safety of other road users as well as yourself! Please remember that you insurance is invalid if you are unable to do an emergency stop or manoeuvre. After your plaster has been removed, you may gradually increase your exercise regime under the guidance of the physiotherapist. Usually, walking, swimming and cycling can be undertaken initially then gradually running followed by low impact, non-contact sports and finally full contact sport. This may take 6 to 12 months.